Zoho CRM is a leading CRM software with features that include contact and lead management as well as HR functionality and social media integrations. However, it’s not always the best solution given its size and complexity. In this article, we found the six best Zoho alternatives based price, features, and functionality, arriving at the best overall. Freshsales (Best Overall) Teams needing a robust CRM with support, chat, and social app integration. Pipedrive Organizations wanting visual pipeline management without extras like social media or productivity apps. Zendesk Sell Field sales teams seeking a powerful mobile CRM app with built-in call recording. Insightly Teams that need an alternative to Zoho CRM with built-in project management tools. HubSpot CRM Agencies and marketers looking for a free, no-frills CRM with paid marketing integrations. Salesforce Essentials Larger businesses needing a fully-featured alternative with service as well as sales tools. Zoho CRM is a fully-featured operational CRM software with functionality that extends beyond the sales process, including support, social media, accounting, and productivity tools. For some, this might be too robust or too feature-specific. To help, we looked for Zoho competitors that offered a better solution for small businesses, assessing things like features, price, integrations, and ease of use. Price/Affordability – We looked at the cost of using the CRM for small businesses and how much value you get, including any additional or add-on costs required for comparable functionality. Contact Management – We compared how easy it is to create, edit, and search for contacts as well as how each tool worked with email, phones calls, and other tasks. Ease of Use – The best Zoho alternatives should be easy to set up and implement for sales teams. Additional Functionality – We considered what additional functionality is available within the software ecosystem, including invoicing, social media, human resources (HR), and productivity modules. Unique Features – We looked at whether the CRM has features that are either not available in Zoho CRM, or are better implemented in a way that makes it more efficient. Integrations – We considered how these Zoho competitors integrate with third-party sales, marketing, and productivity tools. Mobile App – We evaluated which software had the best mobile apps for sales teams in the field, with features that include contact management, built-in calling, and email. Customization – We looked at the options to customize the software according to the needs of your specific organization, including the sales process, contact information fields, and team members roles. Customer Support – We evaluated the level of support and training provided by each software provider, and how responsive they are to customer needs. Freshsales is a fully-featured CRM with robust contact and lead management tools and an intuitive sales pipeline. Freshsales is the best overall Zoho CRM alternative because of its modern, intuitive interface, ease of use, and great mobile app, as well as integration with the complete Freshworks suite of software. It’s ideal for businesses like service providers looking for comparable Zoho CRM software offerings at similar price points. Freshsales offers a free plan, which includes unlimited users and contact management capability. Sales opportunity management, lead assignment, lead scoring, and advanced analytics are available in paid plans ranging from $12 per user per month to $49 0er user per month. Sprout is Freshsales’ free entry-level plan, which provides an unlimited number of users with access to basic contact management and deal functionality. Compared to Zoho’s free plan limit of three users, Freshsales offers far more functionality for far more users. One of the biggest differences is the built-in VoIP calling feature from within the mobile app. That said, the Sprout plan does not include email tracking or the inbox features found in Zoho. The Sprout plan is ideal for small sales teams that are looking primarily for an affordable tool for managing contact relationships and basic deal management. Businesses looking for a free forever CRM will find that the Freshsales Sprout team is an ideal choice, allowing teams to grow and upgrade as they need. Freshsales also benefits from a growing ecosystem of software for help desk, live chat, marketing automation, and a robust library of third-party integrations. The Blossom plan costs $12 per user per month, which is identical in price to the entry-level paid plan of Zoho. In addition to the basic contact management tools, the Blossom plan includes bulk emails with templates and email tracking. It also includes custom fields, sales pipeline, and workflows. While the plans are comparable in some ways, Freshsales allows more advanced integrations to software, including HubSpot and Mailchimp. The Blossom plan is ideal for individuals or small teams that want an entry-level CRM with lead scoring and email tracking features. Freshsales also includes email scheduling at this plan level, which Zoho does not offer, and the email tracking feature is more intuitive in Freshsales. The Garden plan begins at $25 per user per month, and is focused on adding team management and territory management features, including lead assignment and the ability to segment leads by geographic area or industry. Additionally, the Garden plan allows unlimited custom reports for monitoring your sales team performance. The Garden Plan is the best choice for small and mid-sized sales teams that want advanced reporting, but do not need to customize the overall CRM extensively. The Garden Plan is slightly more expensive than Zoho’s Professional plan, which is $20 per user per month. However, it allows unlimited report scheduling, VoIP calling from the app, and adds call forwarding and call transfer features that make it a powerful solution for multi-user sales teams. The Estate plan, costing $49 per user per month, adds reporting dashboards and customized sales processes. In addition, users are able to incorporate the activity of your contacts on your website into lead scoring, which isn’t available on lower-level plans, and isn’t offered in Zoho. Freshsales also offers profile enrichment in this plan, which auto-populates social media and publicly available information into your contact profiles, saving manual data entry time. The Estate plan is slightly more expensive than the relatively comparable Zoho Enterprise plan, but it still includes features that are not available in Zoho in any plan, such as the app calling feature and email scheduling. Freshsales also benefits from deep integration from one of the most intuitive help desk tools in Freshdesk, which directly competes with Zoho’s Desk. Freshsales doesn’t include some of the advance order management and invoicing tools in Zoho. In addition, it does not include pricing books, which is a feature included with Zoho CRM. For businesses that manage inventory, Freshsales lacks some of the advanced tools in the CRM, but it does integrate with other tools like Freshdesk and Freshservice, which provide many of these additional functions. Freshsales users give it high marks for how intuitive and easy the software is to learn and use. They really like how Freshsales displays the sales process, and how easy it is to manage your sales pipeline. Users do mention that they wish there were more robust reporting features and additional customization to workflows and pipelines. You can read more in-depth reviews on our Freshsales Review page. Freshsales is a great CRM, particularly for B2B small businesses. It can also help you manage your relationships with very little setup time and without the need to employ someone with an advanced degree in CRM. While Freshsales offers a free forever plan, you can also give the professional features a try by taking advantage of their 30-day free trial. Pipedrive is a simple-to-use CRM with a highly intuitive pipeline management tool that helps you quickly visualize your sales opportunities. Unlike Zoho, which includes extensive feature sets and direct integration with an entire family of software, Pipedrive is primarily focused on making your sales process more efficient. Pipeline is an ideal Zoho alternative for teams that don’t need the extras and want to focus on managing product and service sales as simply as possible. Pipedrive offers three tiered plans that range between $12.50 per user per month and $49.17 per user per month. That puts it in the middle of the price range for similar products. While there is no free tier, Pipedrive does offer a free trial, allowing you to try it out before you buy. The Silver plan costs $12.50 per user per month, and includes contact management tools, visual pipeline, and configurable reporting. Pipedrive is intuitive and easily customized, even at the entry level, which makes it an ideal choice for businesses focused on moving sales opportunities through their sales pipeline. One area that Pipedrive excels at compared to Zoho is the ability to set both individual and company sales goals in the entry-level plan and monitor your progress. You also have the ability to set user permissions, which is something only available in Zoho on higher-priced plans. Pipedrive also has a much more intuitive sales pipeline tool compared to Zoho, and makes it much easier to get set up and running. The Gold Plan is $24.20 per user per month and is one of the best values of all the options listed here. This plan adds features that include the meeting scheduler, which allows users to send their availability for prospects to pick a time to meet. It also includes the task scheduler and products catalog, which make it a great alternative for businesses that manage product sales but don’t need the operational tools in Zoho. This plan is ideal for businesses that sell both products and services and want insight into their sales including margins, discounts, and splits. The analytics tools give you the information you need to better focus your sales efforts on the opportunities most likely to buy, and on the products that make you the most money. The Platinum plan is $49.17 per user per month, and includes many of the same features as the Gold plan, but adds additional sales forecasting and advanced reporting features. The Platinum plan also includes the ability to set specific permissions for different team member roles, which Zoho does not include (other than territory management on its Enterprise level plan). The Platinum plan is more than twice the price of the Professional plan on Zoho, and $15 more than the Enterprise plan. However, the intuitive pipeline tool, scheduling, and role-based permissions make it an ideal choice, especially for hierarchical teams and teams that want product catalog management without the complexity and setup of Zoho. Pipedrive lacks some of the more robust CRM features found in Zoho, like lead assignment and order management. In addition, as a standalone app, Pipedrive does not offer other customer or productivity software like help desk, chat, or bookkeeping. Finally, it does not offer mass email marketing features that some of the other options offer. Pipedrive users give it high marks for its core features, especially the visual pipeline and intuitive interface that requires little onboarding. Users also give it high marks for its integrations with other third-party software like marketing automation and email marketing tools. Users do express the desire to have more robust webhook integrations as well as advanced search and filtering capabilities. Learn more about what users are saying on our Pipedrive Review page. Pipedrive simplifies the sales process while giving you a means of managing your contact relationships. While other tools require several clicks to navigate deals and locate specific customer activities, Pipedrive organizes information in easy-to-digest visual homepages. You and additional team members can try out Pipedrive’s visual pipeline risk-free by taking advantage of their 14-day free trial. Zendesk Sell, formerly known as Base, is a comprehensive, fully-featured CRM that fits into the overall Zendesk software suite which, like Zoho, also includes a help desk, chat, analytics, and IT management tools. Zendesk Sell, however, has the exceptional mobile app with built-in calling functionality that Base users are familiar with, making it best for users who need built-in mobile calling features and call recording. Zendesk Sell begins at $19 per user per month, which includes contact management, deals, and a mobile CRM app featuring click-to-dial calling and call recording. Higher-level plans are available at $49 per user per month and $99 per user per month, adding tools like bulk emailing, sales forecasting, and lead scoring. The Team plan from Zendesk Sell is $19 per user per month and includes contact management, deals, and one of the very best mobile CRM apps which features built-in VoIP calling and call recording. The Team plan is ideal for small teams or solo entrepreneurs such as consultants or service-based businesses. Zendesk Sell is a part of the Zendesk ecosystem of apps that include help desk, chat, knowledge base, and now a CRM. As a result, users are able to integrate their sales process and contacts within the overall suite of applications that are designed to manage the entire customer relationship. The Professional plan includes sales forecasting, mass emailing, unlimited email templates, sales goals and forecasting, and advanced analytics for $49 per user per month, which makes it the second most expensive plan in this comparison. Based on price, the Professional plan is more expensive than all of the plans offered by Zoho, but the user interface and setup are far more intuitive and updated, making it much easier to configure reporting and dashboards. Zendesk is specifically targeting larger business customers, which is bad news for Zoho since the Zendesk software ecosystem is robust and used by over 100,000 businesses. This plan is a good choice for larger teams that want in-app calling and a powerful and well-designed mobile app for their field sales reps, though it is more on the expensive price range of Zoho competitors. The Enterprise plan provides users with additional sales pipelines, advanced permissions, a product catalog, lead and deal scoring, and activity reporting for $99 per user per month. This plan is actually more targeted at Salesforce than Zoho or other CRMs, but it is a fully-featured business-class solution that some smaller teams will find to be a good fit, especially if they currently use Zendesk software. Inside sales teams that field a large number of incoming leads from web forms or lead lists will find that the dialed and call scripts are valuable tools for connecting with prospects, and the integration with Zendesk help desk software makes this plan a comprehensive, fully-integrated solution for customer care from start to finish. Zendesk Sell does not offer a free forever plan, making it more expensive than some other options when first getting started. Compared to Zoho CRM, it also lacks the comprehensive software ecosystem that includes bookkeeping, social media management, marketing automation, and productivity apps, requiring third-party solutions. 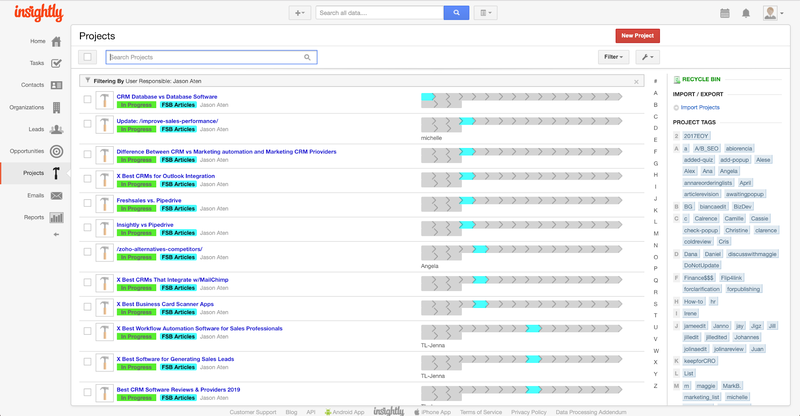 It also lacks some of the more robust automation tools, including ongoing email campaigns. Zendesk Sell was formerly known as Base, and Base customers widely give it high marks for its easy interface, and extraordinarily designed mobile app. Users especially like the in-app calling and call recording features, the highly intuitive reporting, and sales pipeline features. Some users express frustration that the software isn’t updated with new features as quickly as other options. However, that is likely to change now that it is a part of the Zendesk software family. 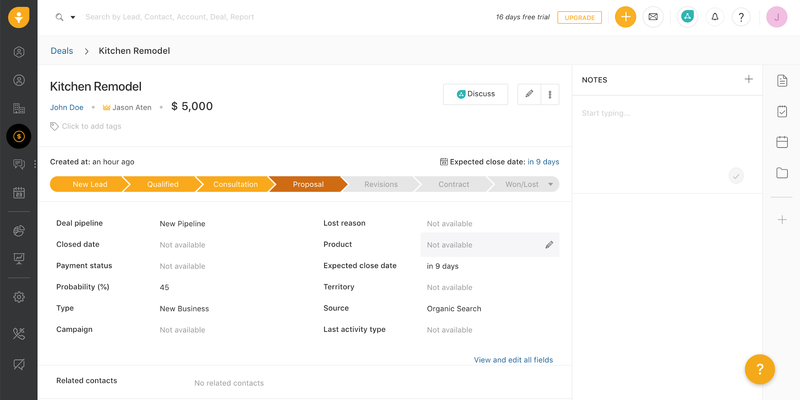 Zendesk Sell is a fully-featured CRM beginning at $19 per user per month, featuring customizable sales pipelines, contact management, and the best overall mobile CRM app. While Zendesk does not offer a free version of Sell, users can sign up for a 14-day free trial of any of the plans. Visit their website today to start your trial. Insightly is a robust CRM with project management features for managing leads, deals, contacts, and customer projects. Unlike Zoho, Insightly does not include support or HR features, but it does allow you to create custom project pipelines that you can use for different types of sales (product versus service versus project). Insightly is a good choice for organizations looking for a software tool that manages both the sales process and projects. Insightly offers a basic CRM plan with contact management and projects for up two users. Paid plans range from $29 and $49 per user per month and include email tracking, advanced customization, and project management tools. While the entry level plans are more expensive than some, they do offer several uncommon features. Insightly offers a free plan for up to two users, which includes basic CRM functionality like contact management, tasks, sales opportunities, and project management. While these features are limited compared to the paid plans, most of them are not found at all in other free options, including Zoho. The free plan, however, does not have some features that Zoho includes, like a business card scanner or calendar sync. The Free plan is a good option for individuals who want to manage customer projects as well as their sales process, but don’t need advanced features. It is also best for users who already use other calendar or marketing tools, and it integrates well with G Suite. Insightly’s Plus plan is $29 per user per month and includes customized project pipelines, email tracking, and lead assignment. Like Zoho, Insightly features a business card scanner, but the business card scanning is often more accurate since it uses actual human transcription. Users can add and manage up to 100,000 records and send 2,500 bulk emails a month, making it ideal for teams that want to target segmented lists with email marketing. The Plus plan, however, does not include the phone dialing capabilities found in several other Zoho alternatives, or the workflow automation found in the Professional plan. For this reason, it is best for sole proprietors or businesses with a simple, non-automated sales process. The lead assignment features, however, make it a good option for companies with specialized teams for different types of leads based on geography, industry, or company size. The Professional plan is $49 per user per month and increases the number of records you can manage to 250,000. This is more expensive than Zoho, but it includes several advanced project management and customization options not included there. It also includes role-based permissions and workflow automation tools, and the project management tools make it a good choice for agencies, construction and landscape firms, and project-based freelancers. The Professional plan compares to Zoho’s top level plan, but has far stronger project management tools. In addition, a wide variety of third-party integrations fill in the gaps in areas like social media management and marketing automation, which are included in the overall Zoho family of apps. This plan is primarily valuable to teams that want to have their managers control and set roles and permissions for their team members. Insightly does not offer the ability to manage quotes and sales orders the way that Zoho does. It also does not include native social media tools or web activity tracking. Only the higher-priced plans include email tracking, and these are less competitively priced compared to Zoho. Users like that Insightly allows so much customization and the Gmail plug-in that allows the creation of contacts and leads directly from the email browser. Users don’t like that the interface is less refined compared to some options, and the search features can be finicky. We use Insightly here at Fit Small Business and you can read more on our Insightly Review page. Insightly is a great tool for managing both customer relationships and customer projects. Insightly eliminates the need for a second project management tool, and helps strengthen customer relationships beyond closing the sale. They also offer the chance to try out their Professional plan for free for 14 days. You can sign up for your free trial by visiting their website today. HubSpot CRM is a free software application that provides businesses with the tools needed to generate leads, manage contacts and deals, and automate the sales process. While the CRM does not include operational functionality like Zoho, it does integrate with HubSpot’s Sales and Marketing Hubs, providing a powerful, all-in-one option for small businesses that use content marketing strategies like blogging, lead nurturing, and social media to generate new customers. HubSpot CRM is free and includes many common CRM features like contact management, deal management, and email marketing. HubSpot also offers additional sales and marketing functionality through the Sales Hub and the Marketing Hub, which range from $50 per month to $800 per month depending on the specific features added. HubSpot CRM includes features like lead capture, contact management, email templates and tracking, and sales opportunity tracking. Innovative features, like live chat that you can embed on your website to capture leads, are also included, along with the ability to track website activity for the first seven days after a visitor becomes a lead. HubSpot CRM includes the ability to embed forms on your website, or to add a tracking code to capture data entered into any existing form on your website. These leads are entered into HubSpot as contacts. While Zoho allows you to create forms, it does not include the smart form tracking and advanced activity reporting found here, making HubSpot a better option for organizations that drive traffic to specific landing pages to generate leads. 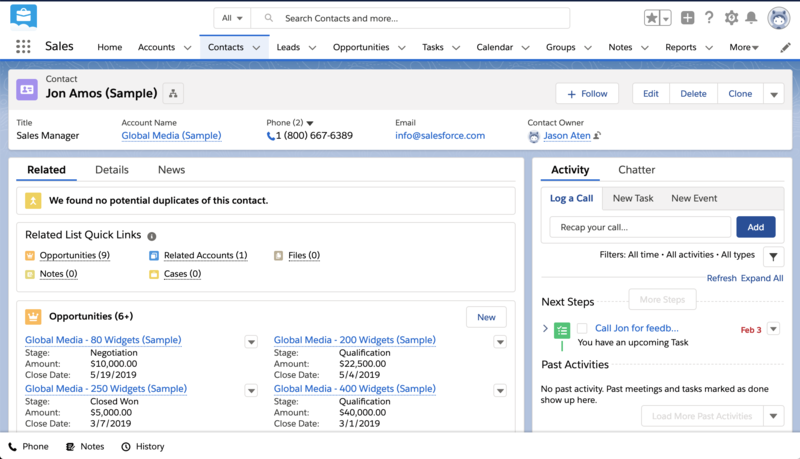 HubSpot CRM includes the ability to organize contacts by company, and provides insights such as a newly added contact’s recent activity on your website. It will also auto-enrich profiles based on information it knows about companies and social profiles. Compared to Zoho’s free plan, the contact management features are far more robust and intuitive, and allow users to score leads based on both profile information and website activity. 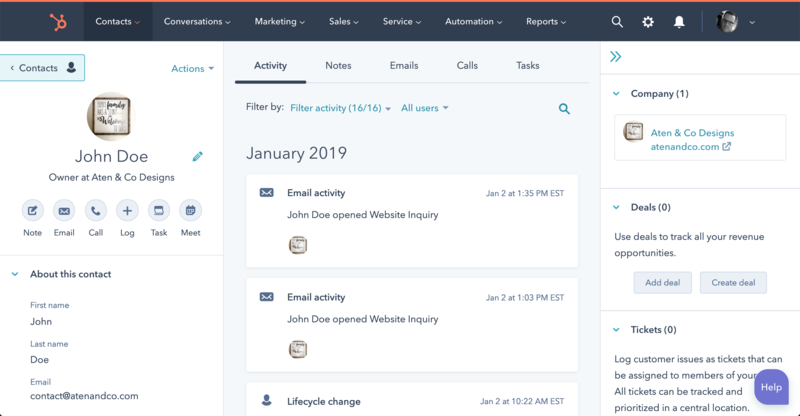 HubSpot CRM gives you the ability to schedule tasks for later follow-up and emails you reminders in addition to creating workflows to handle regular marketing tasks. Compared to Zoho CRM’s free plan, these tools are far more robust and useful in moving your leads through the sales process. HubSpot also features a free chat tool that allows you to use conversational bots to pre-qualify leads that engage on your website, which isn’t a feature in Zoho. HubSpot does not have some of the more advanced CRM features found in software like Zoho. However, the free plan is far more feature-packed than other options. Features like workflow management and marketing automation are also missing unless you also subscribe to either Sales Hub or Marketing Hub. HubSpot offers only limited customer support on the free plan. HubSpot CRM users especially like how easy it is to use but mention that they wish the product offered more reports and workflow automation. Some users also complain that as HubSpot updates the software, user workflows have been disrupted and required them to relearn how to use the product. You can read more on our HubSpot CRM Review page. HubSpot CRM is the best free option, especially compared to the limited features in Zoho CRM’s free plan. For small business that need to manage contacts and deals, and want an intuitive software tool that is both easy to learn and use, HubSpot is an ideal choice. Visit HubSpot’s website to sign up for your free CRM account today. Salesforce Essentials is a powerful CRM from the company that includes standard features like contact management, sales opportunities, mass emails, and customer service. Like Zoho, Salesforce offers a feature-packed suite of software, including support, marketing automation, ecommerce, and analytics apps. However, its scalability and customization make it ideal for larger teams that want one suite to manage their entire customer relationship. Salesforce Essentials is $25 per user per month for up to 10 users, and includes the CRM and Service applications. The Professional edition is $75 per user per month with advanced features including lead scoring, forecasting tools, and campaigns. Sales Essentials is $25 per user per month for up to 10 users, and includes contact management, sales pipelines, deal management, and mass email features. Essentials is built on Salesforce’s Lightning platform, which is a much more intuitive and user-friendly interface compared to the Classic version. In addition, the Essentials plan includes lead capture, a mobile app, and access to the Salesforce App ecosystem. 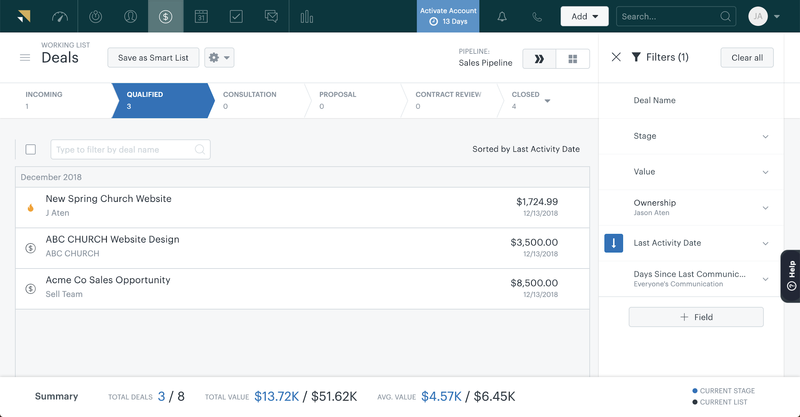 Compared to Zoho’s base level plans, Salesforce is more expensive, but it does include a more comprehensive set of advanced CRM features as well as built-in service and support features. While Salesforce does not offer a free plan. Essentials is ideal for businesses that have a small sales team but need a robust set of CRM features and want to take advantage of the extended Salesforce family of applications, including their marketing cloud, service, support, and analytics. Salesforce Professional is what most people think of when they hear Salesforce. Professional is $75 per month per user, and is the fully-featured CRM platform used by more businesses than any other CRM. Professional includes lead scoring, forecasting, advanced reporting, and permission features, as well as extensive customization options. The Professional plan is designed for larger sales teams and individuals who need advanced features like lead scoring, campaigns, order management, product catalogs, and forecasting. Professional is a good choice for established B2B sales teams that manage high-level sales opportunities. This plan includes more functionality than any of the other options we reviewed, but it is significantly more expensive than Zoho’s most comparable Enterprise plan. Salesforce Essentials does not allow you to add more than 10 users to your account. For teams with more sales reps, you are required to subscribe to the Professional Edition, making Salesforce a much more expensive option than Zoho CRM. Salesforce Essentials also lacks HR and social media management features, both of which are found in Zoho without expensive add-ons. Users give Salesforce Essentials high marks for the user interface, which is far more intuitive than the legacy Salesforce platform. Many users rate Salesforce highly for its advanced features and customization options as well as its reporting and analytics. Negatively speaking, users comment that Salesforce requires extensive setup and training. For more reviews, visit our complete Salesforce Review Page. Salesforce Essentials is a powerful CRM for $25 per user per month, for up to 10 users. In addition, the Professional plan is $75 per user per month with advanced CRM features. Salesforce offers a 14-day trial, allowing users to try out the plan that best fits their needs. Visit Salesforce to sign up for your trial today. Zoho is a comprehensive CRM and is tightly integrated into the entire Zoho software ecosystem, making it a powerful tool for managing customer relationships, sales, and support. 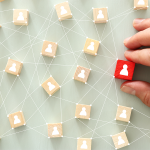 At the same time, many organizations may not need advanced operational capabilities like HR and invoicing, or are looking for a solution that provides core CRM functions with a greater ease of use or more customization. We find that Freshsales offers a better value and better overall user experience, as well as features that don’t exist in Zoho, like calling and call recording. You can sign up for a 30-day free trial or the Freshsales Sprout plan, which is free forever. Visit their website to sign up today. Jason Aten is a Staff Writer at Fit Small Business, specializing in small business sales. In addition to starting and running two small creative businesses himself, Jason has served as a marketing and sales consultant and business coach to dozens of entrepreneurs. Prior to joining Fit Small Business, Jason was the founder and creative director of a digital content marketing agency in Lansing, MI. When he's not writing or helping other businesses fine-tune their sales process, he and his wife enjoy traveling and creating adventures with their 4 young children.